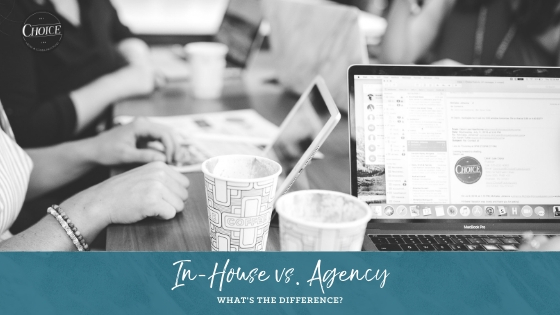 In-House vs. Agency Communications: What is the difference? Here at Choice, we are constantly asked about what we do. We are often asked what services we offer, who we work with, and why PR is needed. Our Founder and CEO Heather Adams recently addressed the last question in this video. 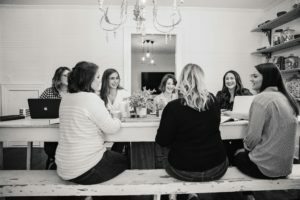 As a boutique media and communications firm, we adore sharing what we believe in and the “why” behind the work that we do, and the way we do it. 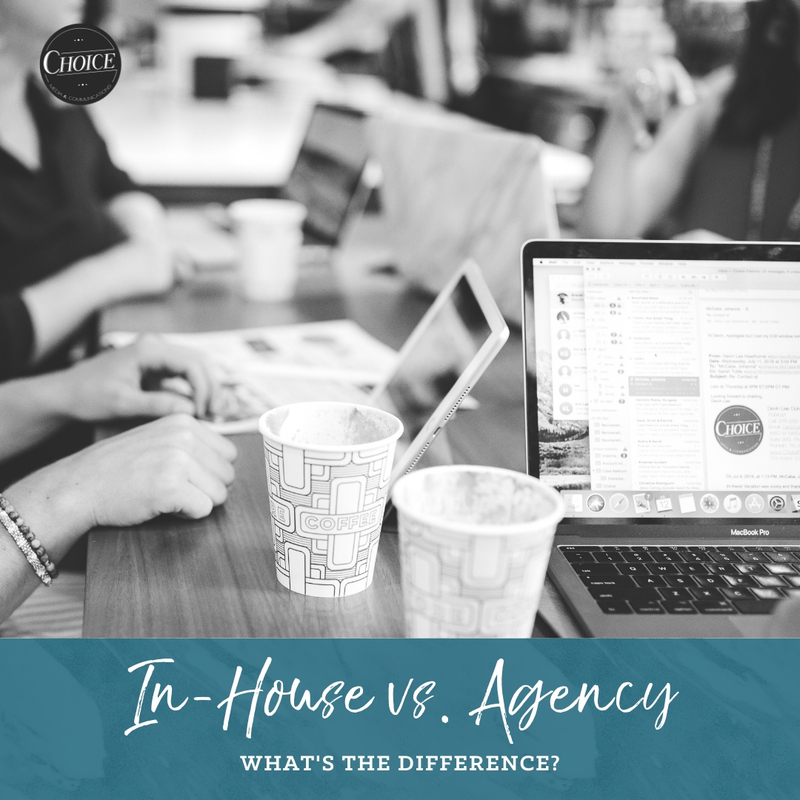 So, we thought it would be helpful to address another common question regarding our work, “What is the difference between communications In-House and in an Agency? An in-house communications department functions as a unit inside an organization and is there to assist that particular organization’s needs. A communications firm (or agency) is independent, and it is designed to serve multiple businesses, brands, and people. Both of these types of communications offer many advantages and benefits. However, it is important to understand that there are some key differences in how they operate, communicate, and perform. 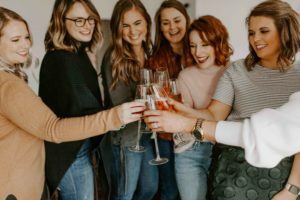 Culture and Collaboration – Often, if you are working in-house, you may be the only practitioner there in communications. Meaning, you may be the only person working on communications for the organization. In a firm, you have a team of people all practicing the same communications style, doing the same type of work. Clients – At a firm, you are serving multiple clients daily from industries all across the spectrum. As a practitioner in the firm, you most likely have numerous clients and projects going on simultaneously. Convincing the Need for Communication – If you are working in-house, that means the organization has already recognized and taken action for their communications needs. At a firm, one of your jobs is to convince clients and prospects that they need communications efforts, and why they are uniquely beneficial to them. Creativity – An agency environment often promotes creativity as you have multiple people doing the same work bouncing ideas off of each other. 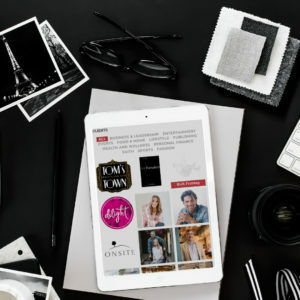 Also, with a variety of clients, you have the opportunity to discover new and innovative ideas as you are working on many different campaigns. Media Relations – When you have multiple clients in a range of sectors, you have the opportunity to develop relationships with more media contacts. Opportunities – Working at a firm, especially one that is a boutique style, often presents opportunities sooner. 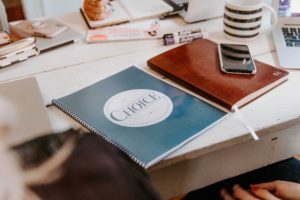 Since joining Choice, I have had the opportunity to lead client campaigns and pitch national media much earlier than if I were at another organization. Workload – The workload and day can look very different between an agency and an in-house setting. You may be doing the same type of work; however, in an agency, you are juggling multiple clients at a time. In-house, you may have one client, but, you are still managing many different projects within communications. Communication with Management – At a firm, you do not always communicate with the top-level management of your client. You may be working directly with the communications team and not have access to certain people. While in-house, you typically have direct access to management as you are in charge of all communications for the organization. Business Development – In a firm, you get the opportunity to be involved in new client acquisition. Getting to learn the ins and outs of business development within communications is a considerable benefit. Your Team – No matter what type of organization you are apart of, your team must matter. At Choice, we take into serious consideration our team and the encouragement of each other. A win for one is a win for all, and we celebrate each other daily to benefit all of our communication efforts. We hope these points are helpful to you when looking both at in-house and agency communications. Whether you are looking for a job, seeking a communications partnership, or just interested in the industry, it is essential to know these differences. We wish you the best of luck in your search!